That apparently wasn't enough. Tuesday's election was plagued with problems, ranging from faulty machines that contributed to long lines to ballot shortages and voter intimidation. While no one is suggesting that these problems affected the overall results, they again highlighted the inability of the world's preeminent democracy to carry out its most basic function. Watchdog officials seemed relieved that this wasn't a closer election. Election Protection, a nonprofit monitoring group in Washington, said that as of 8 p.m. E.T. 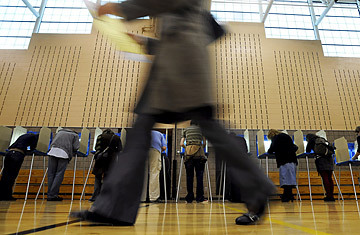 Tuesday it had received 50,000 reports alleging voting irregularities. The problems seemed most prevalent in Florida, Pennsylvania and Virginia. In Florida, for example, some of the new optical-scan machines, which replaced the hanging-chad punch machines of eight years ago, broke down, forcing election officials in several counties to place hand-marked ballots in the lockboxes attached to the non-functioning machines. When the lockboxes became full, officials had to stuff ballots into duffel bags or stack them on the floor. "Not the most secure place," said Jon Greenbaum, Election Protection's top lawyer. There were also disturbing reports of partisan attempts to suppress voter turnout. Officials at Election Protection said messages were broadcast via robo-calls, text messages and Facebook to discourage young, first-time and minority voters. The tactics, the officials said, seemed suspiciously similar across more than a dozen states. "We're surprised at how ubiquitous it's become, and how sophisticated it's become," Greenbaum said, though he said he didn't have any evidence of coordination behind the various communications. In one example of the chicanery, text messages were sent to students at Florida State University in Tallahassee saying, "Due to long lines today, all Obama voters are asked to vote on Wednesday," according to Heather Smith of the nonpartisan group Rock the Vote. Greenbaum echoed Smith's concern, saying such deception "has been a frequent refrain." Election Protection threatened to initiate lawsuits early Tuesday as the first reports of irregularities flowed into its office. But by nightfall, officials said they were more interested in working out voting kinks with local officials than in taking them to court. John McCain's campaign did file suit in Virginia, contending that the state's counties failed to send absentee ballots to military personnel early enough for them to vote on time. The voting snafus add up to another black eye for American democracy. "In some developing democracies, you actually see more sophisticated voting structures than you do here," Greenbaum said. That's because some of the newer democracies use the latest technologies across the entire country, unlike in the U.S., where elections are operated in a patchwork fashion by local governments. Experts said things could have been much worse if an estimated 30% of voters hadn't cast early ballots before the crush on Tuesday. See pictures of Barack Obama's Victory Celebration in Grant Park.